How do they do it? Seriously. Last night they took home yet another Oscar. And let’s face it, they totally deserved it. Pixar is without a doubt the most successful movie studio of all time. And to honest, their insane success can be attributed one simple thing. It’s all about the story. If it doesn’t service the story—it’s gone. Just watch the behind-the-scenes disc for the Incredibles and you’ll get it. I think there are two additional strengths that make them so unreal: free reign exploration and unbelievable attention to detail. A perfect example is this retro series of exploratory screenprinted posters for their next feature: WALL•E. This is a simple, beautiful yet completely potent way of capturing and promoting the stylistic essence of the flick. It’s also a killer way to entice wannabe, design-savvy Pixar fiends to blog about their up and coming release. Rarely do I actually cheer out loud for a movie trailer—but last summer when the preview simply titled 01.18.08 hit the big screen—I wasn’t the only one cheering. Finally, for our little Valentine’s Day date last night we had the chance to catch J.J.’s latest project that eventually came to be known simply as: Cloverfield. The first question that I’m sure you’re asking yourself is: does it live up to the hype? In a word: yes. It is what you think it is—a monster movie captured YouTube style. But the standout feature is definitely the utterly seamless integration of digital animation and shaky, handheld camera action. Believe me when I say, you buy it. Several critics have significantly knocked the design of the creature itself. I have to say I disagree with them completely. I totally felt it was designed in a way that made it feel as though it was from this planet. It wasn’t too spacey, or too surreal. It had just enough animalistic references for me to accept that it was some displaced creature from the deep. The best choice the filmmakers made was the casting of several non-big-name actors to carry the storyline. This once again helped sell the YouTube, everyman nature of the concept. And frankly, it put just about anyone at risk of getting the axe. You gotta figure if someone like, oh say, Ashton “The Kutch” Kutcher was cast in it for some bizarre reason—you’d automatically think—well, he’s not gonna die. 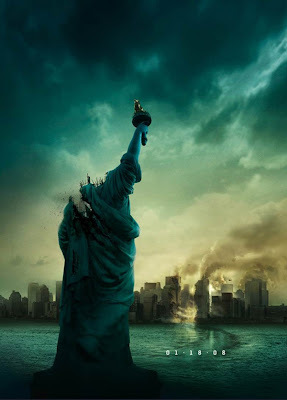 Bottomline, if you’re up for a nail-biter, Cloverfield will do the trick. Just make sure you knock back a couple of Dramamine and get there early enough to sit in the back row of the theater. Well, I’m definitely in the monster mood still, I think Korean filmmaker Joon-ho Bong’s The Host is next on my list! For those of you that haven’t heard, the greater SLC area has been pounded this winter with snowstorm after snowstorm. 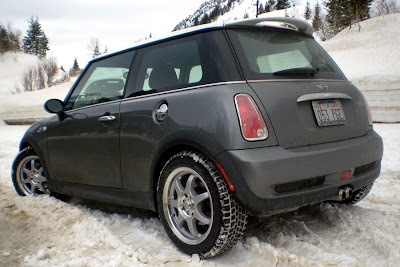 Luckily for me and my MINI’s Pirelli runflat performance tires, a majority of those storms have hit on the weekends when I didn’t have to necessarily drive the MINI and could get away with rolling in our other mini (van, that is). After half a winter of winning Russian Roulette, I felt it was time to stop taking chances and get some moon boots for the rod. I’m blown away by the grip on these bad boys. 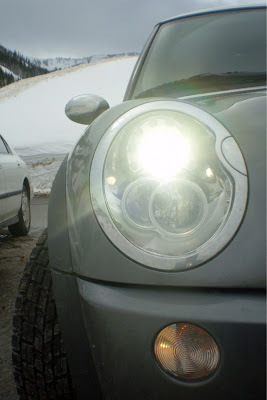 In the snow, the thing’s a tank—yet there’s minimal impact on daily performance. Granted I can’t take the curves like usual, but I suppose that gives me something to look forward to this spring. In the meantime, I’m sure I’ll enjoy both the added cold-weather control and peace of mind that this little MINIzilla now has to offer. These pics were snapped up at Snowbird at Struck’s Annual Manager’s Meeting this morning. Enjoy! I’m Not Saying I’m Gonna Vote For Him (Yet). 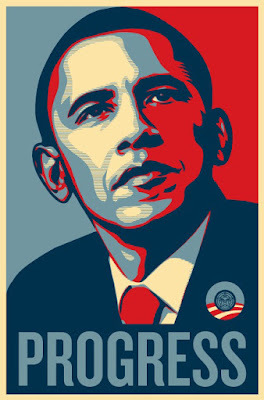 Modern propagandist, Shepard Fairey, recently designed this stunning limited-edition screenprint poster of potential presidential candidate Barack Obama. I guess Andre and his posse could only satisfy him for so long. What’s fascinating about this piece to me is the All-American patriotism that’s communicated through a medium typically associated with movements, oh like, Communism. It’s inspiring, progressive and classic all at once. Apparently there was an original run of 350 and those were all gone within the first day of its release. No matter what the outcome of this year’s election is—there’s no doubt that this poster perfectly captures a remarkable moment in American history. And you better believe that thing will be worth some serious casheesh at some point in time! Check out obeygiant.com for more quality dissent coming to a neighborhood lawn near you.